This is Keir, the Campaign Bear. He was given to me by my two oldest nephews. 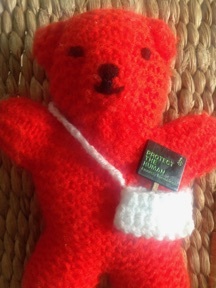 With his striking red wool and a bag obviously meant for carrying leaflets (been there), I decided this was clearly a campaign bear and named him after the pioneering Scottish socialist Keir Hardie, who was born very close to my own home town. Want to know what’s in Campaign Bear’s bag? Do you also have a bag and need some leaflets for it?